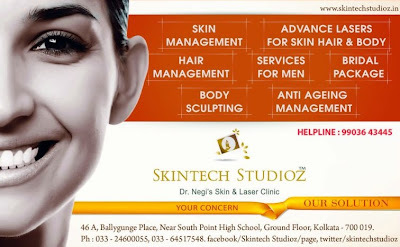 Skintech Studioz Kolkata, Dr. Negi's Skin & Laser Clinic in Kolkata, is the best clinic to get Anti-Ageing treatments, Hair removal laser treatments & other services for Men & Women skin in Kolkata. Skintech Studioz Kolkata (Skin & Laser Clinic) is a contemporary, physician supervised skin & cosmetic care centre lead by Dr. Poonam Negi. Those are looking for Cosmetic treatments, Skin care treatments, etc in Kolkata are welcomed to Skintech Studioz Kolkata. Skintech Studioz Kolkata has introduced the Painless Hair Removal Laser Treatment in Kolkata through their Cosmetic Dermatology team. SkinTech Studioz of Kolkata is having the Soprano Laser service which is a revolutionary Diode Laser System (US FDA approved) for permanent hair removal and painless. So, those who want to remove unwanted hairs [both, male & female] are advised to come at Skintech Studioz Kolkata and get the painless fastest hair removal treatment. Other than Hair Removal Treatments; Skintech Studioz Kolkata also provides following services - Bridal Make-up Body Sculpting, Advance Laser Treatments for Skin, Hair & Body, Facial, Anti-Ageing Treatment etc. Skintech Studioz Kolkata is known for its Hair Loss Treatment, excellent Bridal make-up, Skin Whitening solutions, Anti Tanning solutions, Anti Ageing treatments, and Body Sculpting. People who want to look slimmer & trimmer can also come to Skintech Studioz Kolkata and have few sittings for Body Sculpting (Liposuction process) by which they would lose unwanted fats from their body parts. Don't forget to note down the address & location of Skintech Studioz Kolkata [Skin & Laser Clinic] and may call for an appointment. • Address of Skintech Studioz Kolkata: - 46A, Ballygunge Place, Near South Point High School, Ground Floor, Kolkata-19. • Phone contact number of Skintech Studioz Kolkata: - 033-2460-2255 / 033-6451-7548 / 9903643445. If you are looking for the Skin care treatment cost & Laser treatment cost details of Skintech Studioz Kolkata then please visit www.skintechstudioz.in website.